Is there anything worse, when its mid-morning or 3pm, you’re not quite ‘hungry’ but you need a boost… the biscuit tin is calling your name… HOLD UP! I have a solution for you that your waistline and brain will thank me for! These little balls of energy are perfect to give you a boost and fix you from slump to pump!! Matcha is so damn good, I’ve made previous recipes and talked about it before, I just can’t get enough. So why do I love using matcha (not only in delish tea) but creating yummy treats? Matcha leaves are shaded from the sun in their last few weeks of growth, which increases their chlorophyll and brings out that bright green colour! Then they are finely ground to create a powder. Matcha has a higher value of antioxidants and other benefits compared to other green tea varieties, as you do not strain the tea, rather you consume the whole leaf (grounded into a fine powder). Increased Energy without the crash- Due to the way, they harvest and grow the Matcha, the amino acids within the leaves, help balance the caffeine. It is a great idea to swap you cup of coffee for a Matcha Green Tea! It will give you the energy you need without the jitters of coffee. Antioxidants- Another benefit to Matcha is the high concentration of antioxidants. It has been proven that Matcha powdered green tea has 137 times more antioxidants than regularly brewed green tea!! 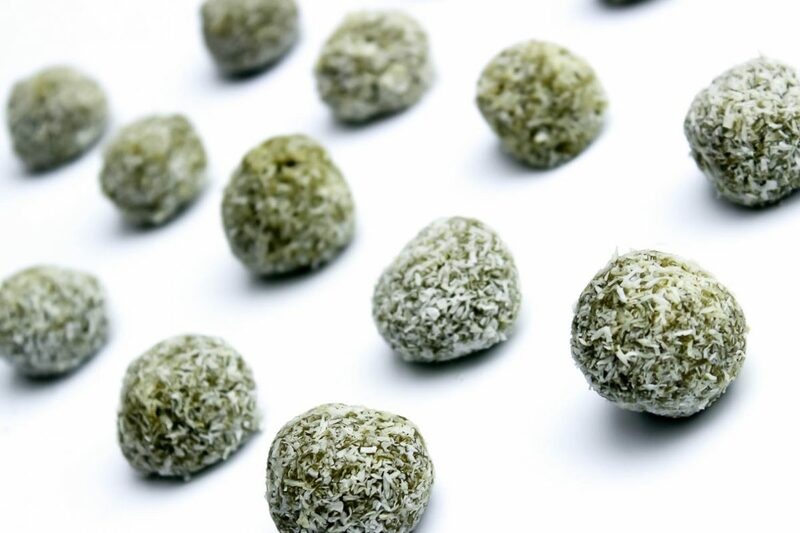 So, with all of this in mind, I knew I needed to create some yummy Mint n Matcha Energy Balls, of course with The Wholesome Heart healthy vibes! These bad boys will help your weight loss journey and reboot your energy levels! Allow cashews to soak for approx. 6 hours. Add all ingredients (incl. cashews) to food processor and blend until fully blended. Roll into balls, approx. teaspoon scoop. Allow to set in fridge for approx. an hour and enjoy!